Scores of dams are being built in the upper headwaters and tributaries of the Amazon River. These have still poorly understood ramifications for nutrient cycling and distribution, migration patterns, and the Amazon rainforest itself. Furthermore, these dams could affect river-dependent communities and worsen flooding in some areas, while generating substantial methane emissions. 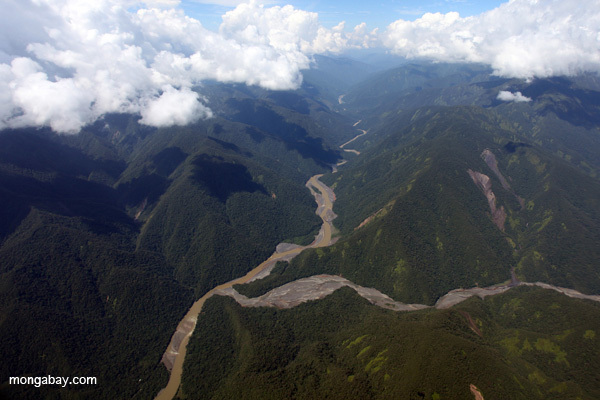 This Northern Andes SRI will focus on infrastructure projects—especially dams—in key watersheds that feed the Amazon River. These watersheds play a significant role for migratory species and in nutrient cycling. The ecological stability of much of the Amazon basin is at stake, in addition to the world’s largest rainforest as well as the ecosystem services that sustain local communities. This SRI will explore the social and environmental impacts of foreign development finance—mostly Brazil’s development bank BNDES but also China-linked finance—in the Western Amazon-Andes region in South America. This SRI offers a special opportunity for joint applicants who will publish both English and Spanish-language stories in various global media outlets, especially those in pertinent South American countries, in addition to the stories originally published in English on Mongabay. Team applications must include two or more journalists and must be submitted in English. Should a team application be selected for this SRI, the grant will be up to $27,000, including $22,000 for a stipend and up to $5,000 for travel to be split among the team members. For information on how to submit a team application, please email SRI Manager Tiffany Roufs. If the winning application comes from an individual or a team that plans to publish only in English, the SRI grant will be $15,000, including $12,000 for a stipend and up to $3,000 for travel. All winners of this SRI will be expected to produce a substantial series of articles to be published on Mongabay under a creative commons license, and to publish additional related articles in external media publications. The winner(s) will have two months for travel and research and two months for writing. Winner(s) can work from anywhere in the world. Please visit our Apply page to find details on submitting an application by the deadline of Sunday, August 24th.